Fellow Svengoolie SvenPals everywhere will be jumping for joy for his upcoming big broadcast of a classic Universal Studios monster entry to start off 2019. 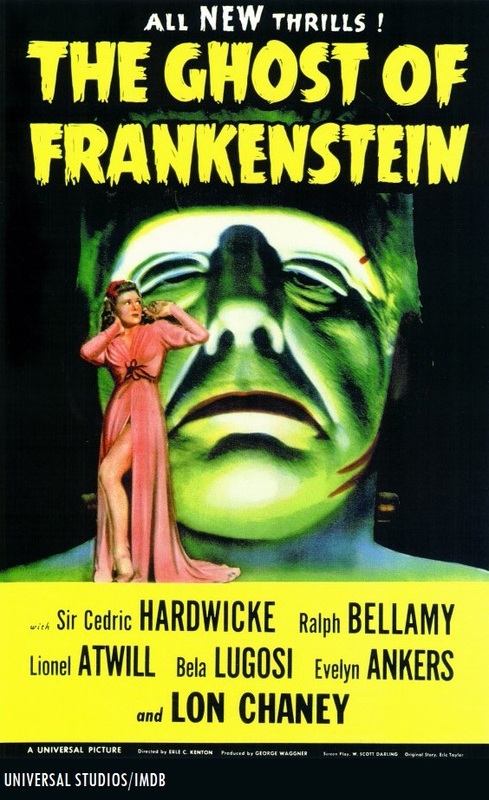 The legendary Berwyn/Chicago-based monster/horror film host will present his big broadcast of the fourth Universal “Frankenstein” monster installment, “The Ghost of Frankenstein” (1942), this Sat., Jan. 5 at 8 p.m. Eastern/7 p.m. Central on Me-TV. “The Ghost of Frankenstein” (1942) was directed by veteran actor-director Erle C. Kenton, who also directed the screen adaptation of H.G. Wells’ “Island of Lost Souls” (1932) for Paramount Pictures. Kenton’s other Universal productions include two comedy vehicles with Bud Abbott and Lou Costello; “Who Done It?” (1942) and “Pardon My Sarong” (1942). Kenton also worked on Universal’s fifth “Dracula” monster franchise feature, “House of Dracula” (1945). This will mark Sven’s seventh big coast-to-coast broadcast of Kenton’s Universal “Frankenstein” entry on Me-TV. He previously showcased “The Ghost of Frankenstein” (1942) back in July 2011*, March 2012*, Nov. 2012*, Nov. 2013, Dec. 2014 and Nov. 2016. According to IMDB, Sven also showcased the 1942 Universal “Frankenstein” entry on his hometown station, WCIU-TV/”The U” back in 2007.
Who was in “The Ghost of Frankenstein” (1942)? The players who appeared in “The Ghost of Frankenstein” (1942) were Lon Chaney Jr. (as Frankenstein’s monster), Sir Cedric Hardwicke (in the dual roles of Ludwig Frankenstein and the ghost of Henry Frankenstein), Bela Lugosi (as Ygor), Ralph Bellamy (as Erik Ernst), Evelyn Ankers (as Elsa Frankenstein), Lionel Atwill (as Dr. Theodore Bohmer), Dwight Frye (in an uncredited role as a villager) Doris Lloyd (as Martha), Leyland Hodgson (as the chief constable), Janet Ann Gallow (as Cloestine Hussman) Holmes Herbert (as the magistrate), Olaf Hytten (as Hussman) and Barton Yarborough (as Dr. Kettering). Fellow Svengoolie SvenPals from coast-to-coast will be looking forward to a vintage Universal Studios mystery feature with an iconic personality of the silver screen. 1945 Universal Studios poster art for “The Frozen Ghost” (part of the “Inner Sanctum” series). 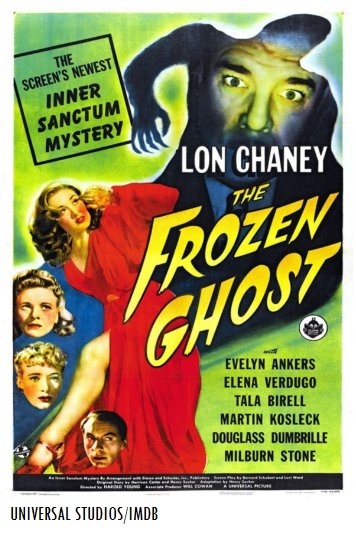 The beloved Berwyn/Chicago-based horror film host will be presenting the 1945 Universal “Inner Sanctum” mystery adaptation, “The Frozen Ghost.” Sven’s showcase starts this Sat., Dec. 2 at 8 p.m. Eastern/7 p.m. Central on Me-TV. The fourth cinematic installment in Universal’s “Inner Sanctum” series was directed by Harold Young. Young also worked on the third film in Universal’s “Mummy” series, “The Mummy’s Tomb” (1943). He also directed the live-action sequences for Walt Disney’s “The Three Caballeros” (1944). The original story of “The Frozen Ghost” was written by Harrison Carter and Henry Sucher. The screenplay adaptation was written by Bernard Schubert and Luci Ward. This will be Sven’s second big broadcast of Harold Young’s 1945 Universal “Inner Sanctum” feature on Me-TV. He had previously showcased “The Frozen Ghost” on Sept. 3, 2016 (the same date that the hit “Svengoolie Stomp” music video with Freddy “Boom Boom” Cannon premiered)! Fellow Svengoolie pals from coast-to-coast will be howling for joy this Sat. during his showcase of a definitive 1941 Universal Studios monster classic. The legendary Berwyn/Chicago-based horror film host will be presenting “The Wolf Man” (1941), this Sat., Sept. 30 at 8 p.m. Eastern/7 p.m. Central on Me-TV. “The Wolf Man” was directed by George Waggner, who also worked on “Man-Made Monster” for Universal in 1940. Later in his career, Waggner directed 10 episodes of the live-action “Batman” TV series featuring Adam West and Burt Ward (from 1966-67). Who was in “The Wolf Man” (1941)? 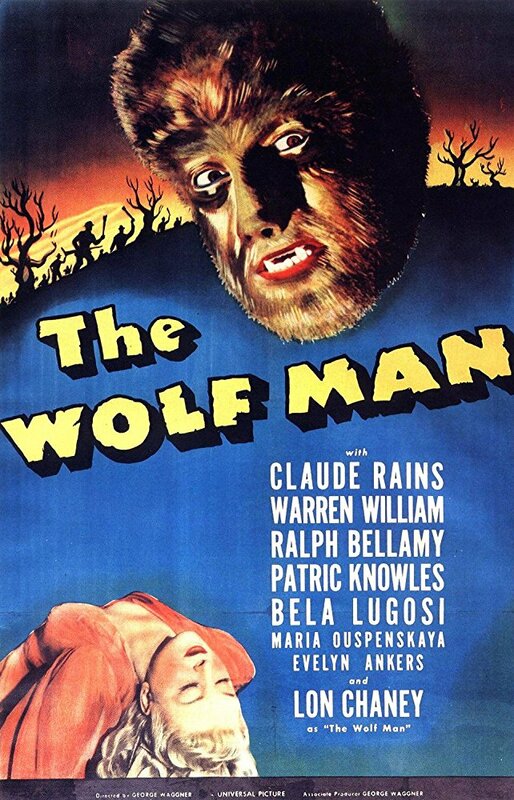 The players who appeared in “The Wolf Man” were Lon Chaney, Jr. (as Lawrence “Larry” Talbot/the “Wolf Man”), Claude Rains (as Sir John Talbot), Bela Lugosi (as Bela), Ralph Bellamy (as Colonel Montford), Evelyn Ankers (as Gwen Conliffe), Warren William (as Dr. Lloyd), Maria Ouspenskaya (as Maleva) and Patric Knowles (as Frank Andrews).